Clinical neurosciences: Where do we go from here? With the most fascinating object of the universe, the human brain, as its raison d'être, neuroscience is easily the most exciting branch of science. Everything we do, all of imagination – everything that we think, we feel, we sense, every thought we have ever had, is produced in its majestic realm. Still, how exactly does this master organ operate remains one of the biggest unsolved mysteries. 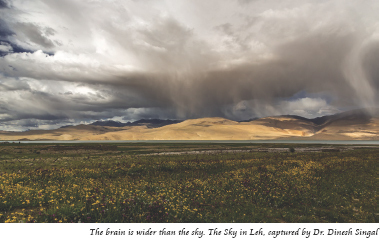 Consider this amazing yet stark truth – how a bundle of 100 billion neurons interconnected by 150 trillion synapses gives rise to such extraordinarily vast capabilities of human behavior? 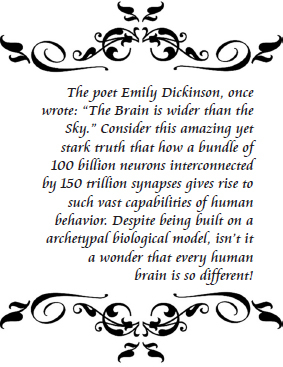 Despite being built on a common archetypal biological model, it is no small wonder that every human brain is so different that it defines us and makes us unique in our own little way, while producing such vast diversity of talents among the billions of people that inhabit the earth. However, the vastness of the human brain does not cease at this. If its behavior in health mystifies us, think of the challenges it throws up in disease. Even as the recent years have been a witness to many exciting advances in addressing these fascinating questions, achieving a deeper understanding of how precisely the human brain functions and what goes awry in various disorders remains a profoundly demanding endeavor. The more we try to probe its secrets, the more surprises it has in store for us. Indeed, while it sits high on our shoulders, the human brain is the most complex known object in the universe. The modern era has been a witness to a large number of outstanding advances in science. Progress in neuroscience has benefited greatly with the development of increasingly powerful methods for acquiring, analyzing, and sharing data. 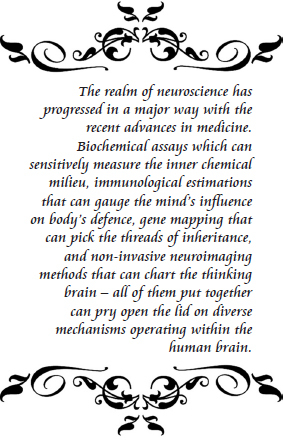 Biochemical assays that can sensitively measure the inner chemical milieu, immunological estimations that can gage the mind's influence on body's defense, gene mapping that can pick the thread of inheritance, and noninvasive neuroimaging methods that can chart the thinking brain can pry open the lid on different mechanisms operating within the human brain. With these advances, a host of new data now stands revealed before us. If we were to dwell on just one of the newer neuroimaging methods – for instance, the magnetic resonance imaging (MRI), its capabilities and potential are truly immense. In human brain studies, it has become a workhorse technology because of the diversity of information it is capable of obtaining. Structural MRI. The “structural MRI” provides simple but high-resolution images of the brain and is helpful in making geometrical models of brain structures which are necessary for modern brain imaging analysis. It is useful in analyzing subtle aspects of brain architecture, such as the thickness of the cerebral cortex or the amount of neuronal insulation, myelin, within the gray matter. Task-activated functional MRI. The “task-activated functional MRI” identifies which brain regions are relatively more activated or deactivated during performance of behavioral tasks, based on the blood oxygen-level-dependent (BOLD) MRI signal, which is modulated by neural activity via a process of neurovascular coupling. 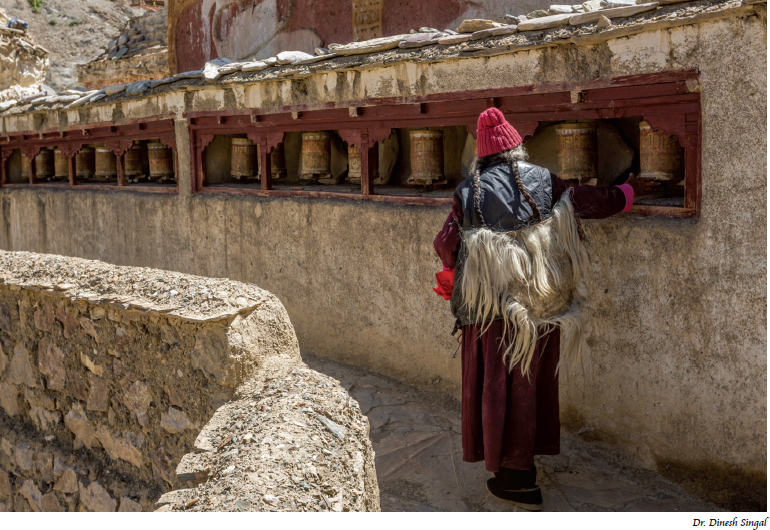 The quest has been to integrate information across diverse approaches and across different studies and understand how the macro- and micro-facets of life, including biological, social, cultural, and political factors, affect the apparatus of human brain. With the overarching objectives of acquiring, analyzing, and freely sharing information about brain circuitry and connectivity, the National Institutes of Health neuroscientists' community gave birth to a multi-institutional consortium, the Human Connectome Project (HCP) in 2009. Its goal is to map the hundreds of functionally distinct areas or “parcels” of the human brain and to understand how these areas are connected and how each contributes to the complex human behavior. 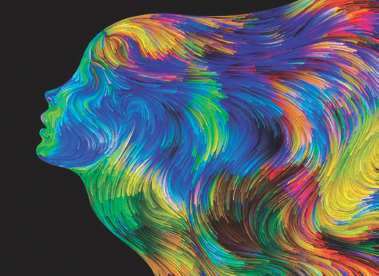 At the same time, efforts are afoot to understand how the brain's complex functional systems go awry in neurological and psychiatric diseases. A greater understanding of the physiological and pathological brain mechanisms would perhaps someday pave the way for an effective molecular treatment of many of the diseases. While the HCP engine continues to make a steady progress building a new “HCP-style” neuroimaging paradigm across the full human lifespan – from the time a fetus begins its journey in its mother's womb to the final years of life, the European Union has launched the “Human Brain Project” on October 1, 2013. The “Human Brain Project” uses the exascale supercomputers computing systems capable of at least one exaFLOPS, or a billion–billion (i.e. a quintillion) calculations per second; and its core objective is to simulate the brain and to develop brain-inspired computing, data analytics, and robotics, and simultaneously, to gather, organize, and disseminate data describing the brain and its diseases. Perhaps, in times to come, this could open new avenues to develop a bionic man, where damaged parts of brain could be replaced with artificial intelligence chips. Stem-cell therapy also appears to be hitting a rapid exponential growth curve. Currently, researchers are finding newer effective ways to provide a permissive environment for the growth and differentiation of neural cells. The recent three-dimensional cell culture systems, for instance, provide a closer biomimetic environment and promote better cell differentiation and improved cell function. These new neural tissue-engineering techniques aim to develop novel approaches to treat the diseases of the nervous system. Human cortical spheroids which can repair cortical neural tissue and embryonic stem cells that can create neurons of the cerebellum are no longer a pipe dream. 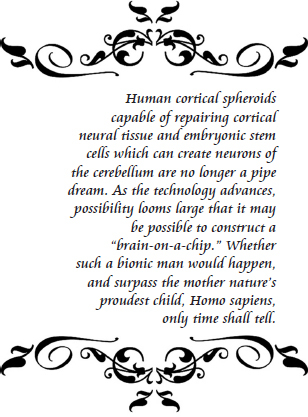 As the technology advances, possibility looms large that it may shortly be possible to construct a “brain-on-a-chip.” Whether such a bionic man would happen and surpass the Mother Nature's proudest child, Homo sapiens, only time shall tell! Glasser MF, Smith SM, Marcus DS, Andersson JL, Auerbach EJ, Behrens TE, et al. The Human Connectome Project's neuroimaging approach. Nat Neurosci. 2016;19 (9):1175-87. The Human Brain Project. https://www.humanbrainproject.eu/en. Song CG, Zhang YZ, Wu HN, Cao XL, Guo CJ, Li YQ, et al. Stem cells: a promising candidate to treat neurological disorders. Neural Regen Res 2018;13:1294-304.